What does it mean to break even? Basically, your income is equal to your costs and you have zero profit. Now, why would anyone want to know how to generate zero profit? That’s a good question. The point isn’t to aim for the breakeven point, but to be aware what it is so that you always aim above it and so that you know what buffer you have. The tricky part to calculating your breakeven point is separating fixed and variable costs. These are the costs that are independent of the level of your sales. Think of things like rent, electricity, accounting fees, (some) wages. They’re the things you would typically allocate to expense accounts in your accounting system (or your bookkeeper would). Now, we’re generalising a little here and we are talking about relatively short time frames (a year or less). If you double your revenue in the next 5 years, it’s highly likely that you’ll need to rent a bigger place, add some admin staff and so on – but, let’s keep this simple and focus on the short term where those things won’t change much. When you look at the Fixed Costs line on a Breakeven Analysis chart, it will be horizontal. These are the ones that do change as you sell more. If I sell an extra toothbrush, I need to buy another toothbrush to replace my stock. When my sales team get paid commission, the more they sell, the more commission they will be paid. In a service business this could be when charging clients by the hour (or 6 minutes!). Alternatively, when using a contract or casual workforce, the cost of that labour is a variable cost. The simple question to ask is this: If I sell more, do these costs increase? Usually your bookkeeper will allocate these costs to the Cost of Sales section of your accounts. 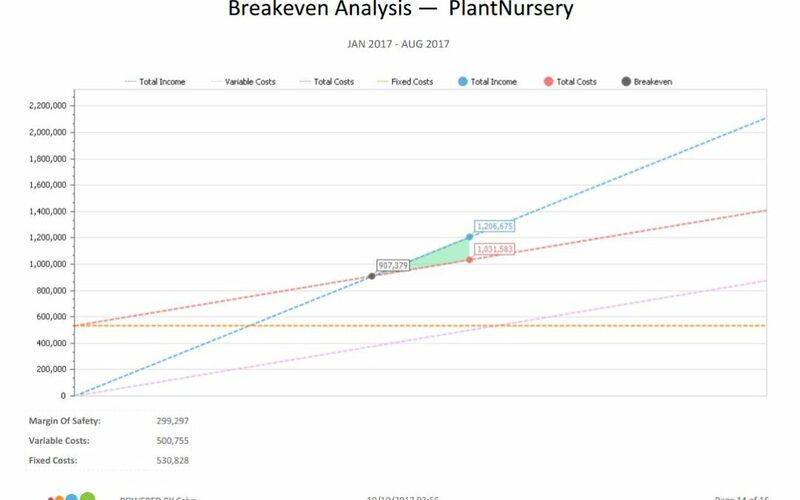 In the Breakeven Analysis chart, the Variable Costs line starts at zero (no sales implies no costs) and then rises in a straight line. A steeper line indicates smaller margins than a shallow line. There are no prizes for guessing this one. It’s simply adding up Fixed Costs plus Variable Costs. On the chart this is represented by a straight line sloping upwards from the beginning of the Fixed Costs line. Where it intersects with your income line, that’s the Breakeven Point. It’s the amount of income you need to earn to cover your total costs. In an ideal world, your actual income is above this point but it’s good to know when you’re planning. So ask yourself, if you’re adding new costs, are they fixed or variable and how will they affect your breakeven point?